Having a large 0.96 inch OLED display and an intuitive menu system, the eVic Primo Fit is such a compact starter box mod available in multiple stylish finishes. Featuring the new bulging glass tube and convenient push-to-open top filling system, the EXCEED Air Plus atomizer also presents you with more spare resin and cellular tubes. EX series heads with novel designs are meant to provide pure flavor with great vaping experience, no matter for mouth-to-lung or direct-lung. 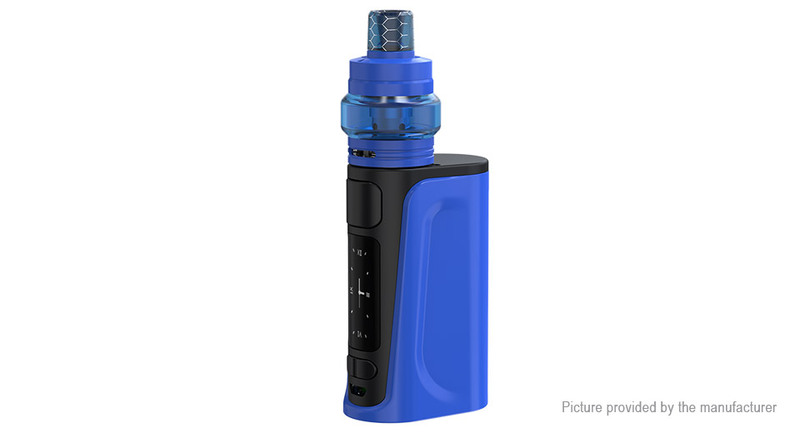 The eVic Primo Fit reaches a formidable 80W power along with a sequence of unique features including 2A quick charge, preheat, clock and timeout safety protect. Extraordinary & more capacity: Introduce the new bulging glass tube, new shape, new colors and new materials. Capacity was also upgraded to 3.0ml with such bold tube. Filling with ease: The EXCEED Air Plus atomizer adopts the push-to-open top filling design. Simply push the top cap to reveal the filling hole. Then you&apos;re free to go. EX series heads: The EX series heads, including EX 0.5ohm direct-lung head (best at 28W) and EX 1.2ohm mouth-to-lung head (best at 12W) with unique designs are especially and perfectly designed for the EXCEED Air atomizer. The EX series heads are meant to offer you the perfect original flavor ever. Refined airflow control system: In order to pursuit the ultimate vaping experience, a precise and sophisticated airflow system was applied into the EXCEED Air Plus atomizer. Three small holes for mouth-to-lung inhale and one wide slot for direct-lung inhale. Detachable structure, easy to clean: The EXCEED Air Plus atomizer can be easily detached and is able to wash separately. Intuitive & simple: Featuring a 0.96 inch OLED display, coupled with an easy-to-go menu system, the eVic Primo Fit handles swiftly at your convenience. 80W with 2800mAh: The eVic Primo Fit is powered by a built-in 2800mAh battery. With 80W max output, it’ll surely satisfy you for your daily vaping. 2A quick charge: The eVic Primo Fit has 2.0A maximum charging current with which it can get fully charged more quickly than normal ones when using the Avatar quick charger (sell separately). Upgradeable firmware: eVic Primo Fit comes with the upgradeable firmware. Having the latest firmware, real-time clock, preheat, custom logo, and timeout protect are all available. Charging: Simply charge the eVic Primo Fit battery by connecting it with a PC or wall adapter via USB cable. When it is fully charged, the indicator light will go out.